One of the technology's advantages over conventional offshore wind turbines is the cost savings from not having to build foundations and towers. Technology that uses flying drones to generate electricity from the wind is getting a boost from a German utility company, which is backing a test project that may show if it can help cut the costs of producing power offshore. The machines stay airborne like kites to tap the energy of high-altitude wind currents. The force of the wind would push forward the drones, which would tug at a cable anchored to drive a power turbine. The technology still is in its early stages, with a handful of pilot projects around the world, including one bought up by Google parent Alphabet Inc. in 2013. TwingTec, a Swiss company, is working on a system that allows the aircraft to take off, fly and land autonomously from a platform. When in flight, the drone moves in a continuous figure-8 pattern at an altitude up to about 1,000 feet. The aircraft also automatically moves up and down, pulling the tether that drives the generator. EON believes the industry could take off in the first half of the 2020s, according to spokesman Markus Nitschke. The company is planning to be an early adopter of the technology, he said by email. Airborne energy is projected to be cheaper than the mainstream form of offshore wind power if it is commercialized partly because it wouldn’t use as many materials. Foundations and towers for traditional wind turbines make up about 30 percent the capital required to install the equipment offshore, according to Bloomberg New Energy Finance. Moving into deeper waters farther off the coast will increase those costs, although the windier conditions may balance this out by driving the turbines more often. The drones are also expected to have more energy-producing potential because they fly higher where the winds are stronger, according to Udo Zillmann, head of the Airborne Wind Energy Industry Network. EON is working with Ampyx Power, a Dutch developer, on the project. EON will build and operate a demonstration site for airborne wind energy in northwestern Ireland, which Ampyx will use for its current trial and the next version of its machine, which it hopes will be commercialized. The company expects to start testing by mid-2018. EON wants multiple companies to use the site eventually. 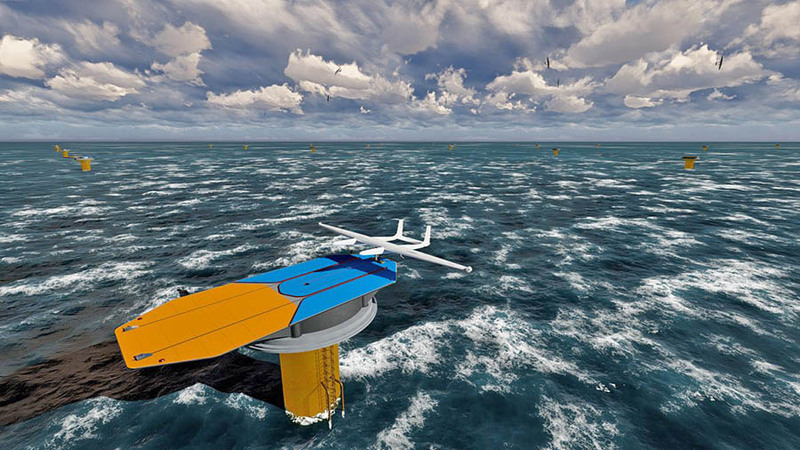 This conceptual illustration shows a power-generating drone stationed on an offshore platform between flights. Ampyx Power is developing a site in northwestern Ireland to test the system.